If I think about it, I have been lucky enough to witness the awe-inspiring power of nature many times, in so many ways. But when I read this question, the encounter that came to mind first was with an animal much smaller than I am. It was a Promethea Moth (Callosamia promethea), one of the beautiful large silk moths. but I had never found a chrysalis. Spicebush Swallowtails have evolved to depend on members of the laurel family as caterpillar food (host) plants. Where I live, this means Spicebush (Lindera benzoin), and Sassafras (Sassafras albidum) are the plants on which Spicebush Swallowtails rely for their species’ survival. So I went to a place that I know has a lot of Spicebush and Sassafras, Bowman’s Hill Wildflower Preserve, to search for chrysalises. While I was unsuccessful in my hunt for a butterfly chrysalis, I did find this curious construction, which turned out to be a Promethea Moth cocoon. 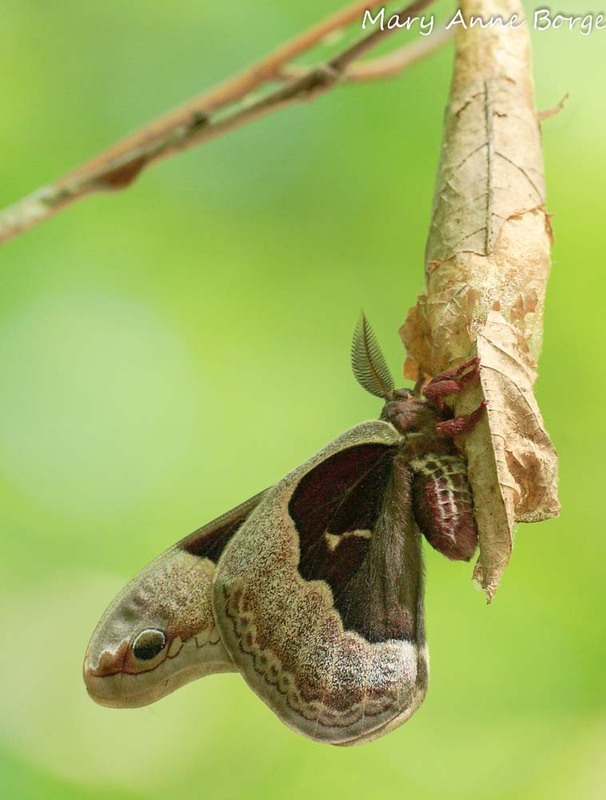 Promethea Moth caterpillars have the ability to spin an amazingly strong silk that they use to reinforce the attachment of a leaf stem to its branch and surround themselves with a protective silken cocoon, using the leaf as the outer covering. The result is a perfectly disguised shelter that looks like a dead leaf hanging from a branch. Here they stay all winter long, emerging in late May, unless they become a meal for a clever bird that isn’t fooled by the cocoon’s subterfuge. 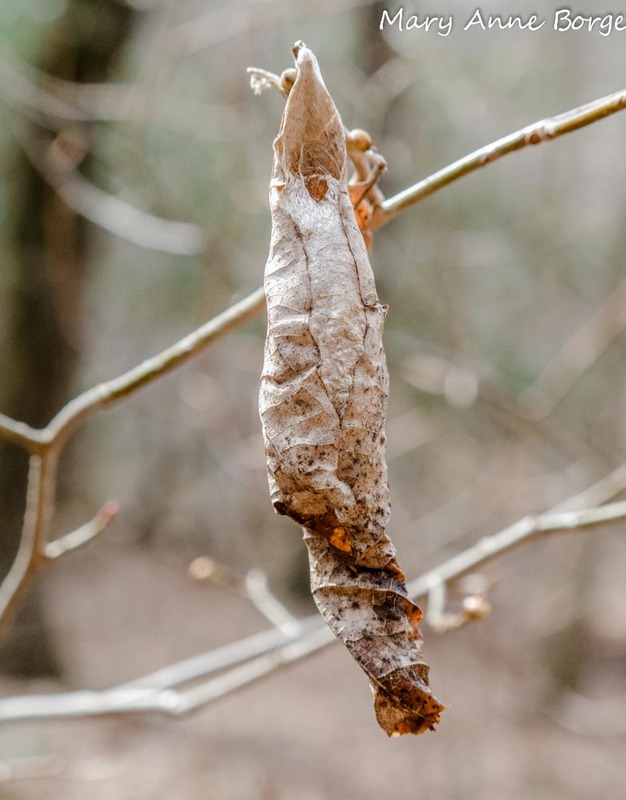 I kept an eye on the cocoon throughout the winter and early spring, checking on it whenever I visited the preserve. I am a naturalist there, and often lead tour groups. 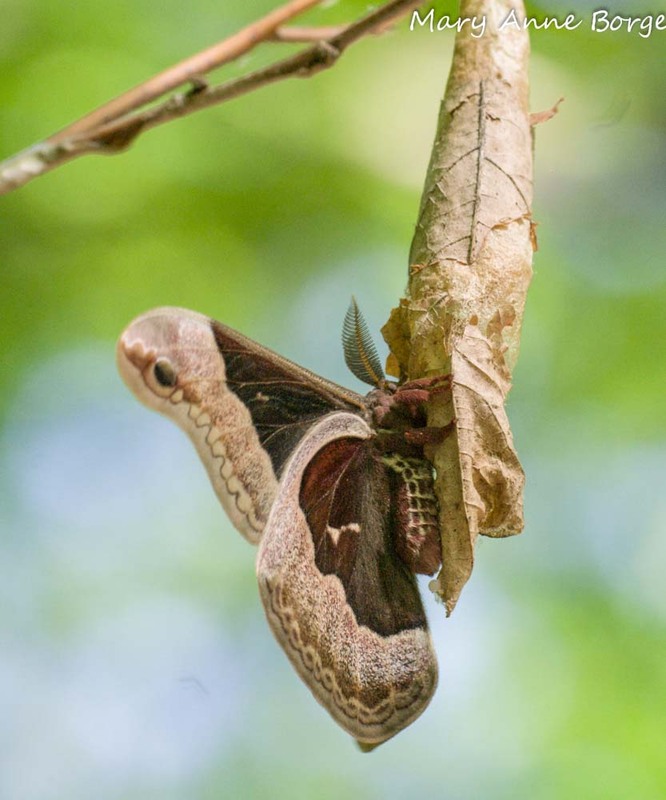 I was leading a 2 p.m. walk one day in the third week of May, telling the group about Spicebush Swallowtail butterflies, Promethea Moths, the cocoon we were about to see, and the fact that the moth would be emerging soon. When we reached the Spicebush, a gorgeous adult Promethea Moth was clinging to the cocoon. While it posed waiting for its wings to harden, the members of my tour group were able to take photos. Eventually, we tore ourselves away and went on with the walk. We were surrounded by beautiful spring blossoms, but the Promethea Moth remained the highlight for us all. When the walk ended, I left my group at the visitors center, went to my car to get my camera, and returned to the moth. Still there! I was able to take a few photos, then witnessed the moth move its wings, flutter them, release its grip on the cocoon and take off into the air above to seek a mate. Prometha Moth, ready for take-off! What a ‘one with the universe day’ kind of day! 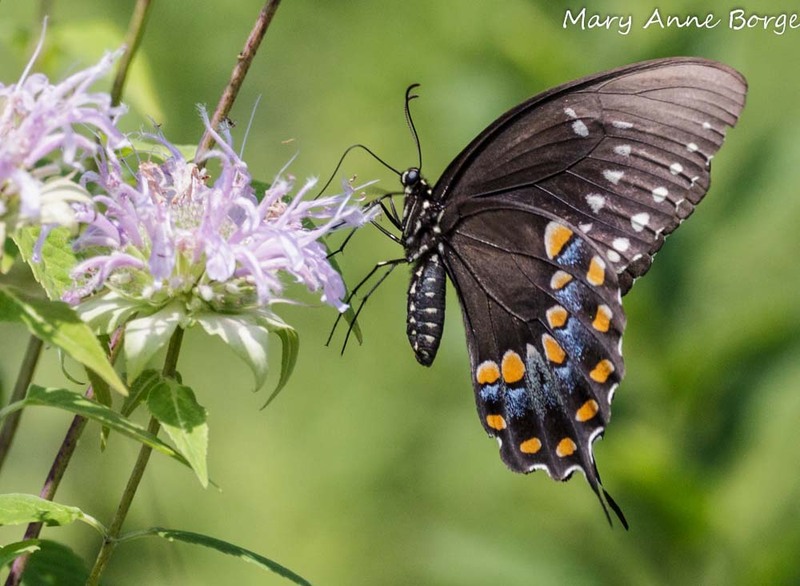 This entry was posted in Butterflies, Gardening for Wildlife, Other Insects and Spiders and tagged caterpillar, cocoon, nature, Prometha moth, Spicebush Swallowtail Butterfly by Mary Anne Borge. Bookmark the permalink. i think both of my cocoons are female, believe it or not, your story encouraged me to buy some! i live further west so i will have to go east for them to find a mate. Just came across this great post & photos while searching to find out what kind of moth I recently saw. Definitely the same kind as in this post. We are so fortunate these days to have info at our fingertips! Great photos! Thank you! I’m glad you found the post helpful. What a treat to see a Promethea Moth! moths are awesome, MOTHS FOREVER! Thanks. That was enormously helpful. 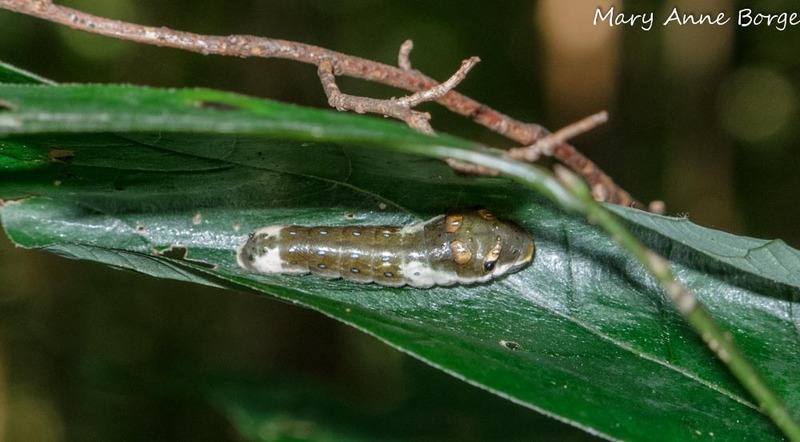 I just found a chrysalis like this today and was trying to identify it. I’m glad the post was helpful to you. There are a series of books by John Eastman that I find really helpful when I’m trying to identify things like a new cocoon. It was his ‘The Book of Forest and Thicket’ that tipped me off to the identity of this cocoon the first time I spotted it. Isn’t nature beautiful, thank you for sharing. So beautiful! I feel like awe-inspiring nature is all around us, every day. We just have to be open to seeing it. what day and month was it when it hatched? The moth emerged from it’s cocoon in late May, mid-afternoon.